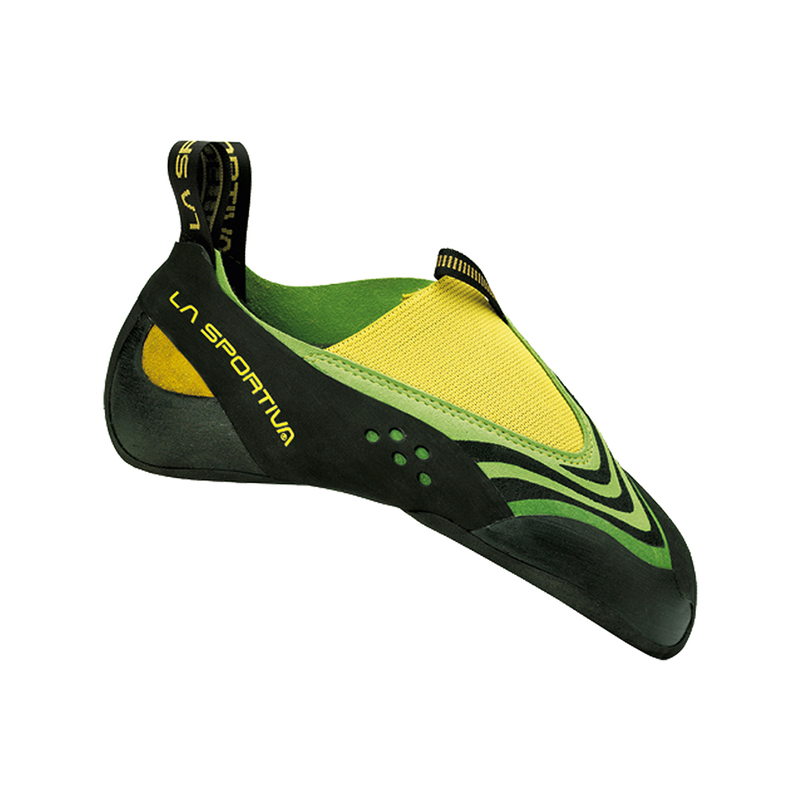 The La Sportiva Speedster is a highly sensitive No-Edge® slipper climbing shoe designed for hard bouldering and technical sport climbing. Adam Ondra wore the La Sportiva Speedster on his first 9a onsight, which he said was thanks to the No-Edge® technology that enabled his feet to climb much faster than an ordinary shoe with a sharp edge would. Essentially, No-Edge® technology makes foot placements much more forgiving, as the increased contact-surface area and ability to pivot and roll on tiny footholds allows you to be generally less precise and move with greater speed. Hence the name, Speedster! La Sportiva say they have designed this shoe with zero foot restriction, maximum sensitivity, and complete freedom of movement. With a 3mm thin midsole, this is probably one of the thinnest midsoled shoes on the market. Bending and flexing this shoe will be very easy indeed, increasing performance on steep climbs and also whilst toe-hooking, which the extended toe rubber will also assist with. Being unlined, there are no hinderances to sensitivity at all. No doubt you can feel every minute feature in this shoe. 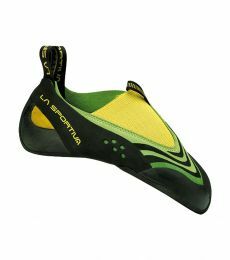 And, the P3® rand system has also been included by La Sportiva which maintains the shoe's aggressive shape over time to increase longevity. The Speedster is designed for medium volume feet and is advised to be worn as snugly as possible for maximum performance. Bear in mind that the upper is suede leather combined with microfiber, so there will be some stretch in the shoe. Size appropriately. The natural evolution of a winning compound, XS Grip 2 rubber improves upon the superior grip characteristics of XS Grip and delivers outstanding precision in the form of support, shape and stability. It provides exceptional grip in every condition and was developed especially for climbing shoes by Vibram. A great little shoe, once they are worn in they are brilliant for smearing, the heel is reasonable for heel hooking. A great all-round shoe. The small step is very stable, the shoes are very fast and comfortable, but the elastic band seems to be a little elastic and tired soon, the recommended size of the website is accurate. After years of climbing in solutions, I thought i'd branch out. They've got a very similar shape to solutions, snug heal which stays on well despite being a slipper and surprisingly comfy within 3-4 indoor sessions. Hoping they'll be good Font shoes due to how soft they are. Very pleased so far. My go to training shoe and all rounder. This is my third pair of these over the course of about 5 years. Great for everything inside. Once you get used to no edge technology it's very effective. They were really good in magic wood a few years ago. Really, really good on anything that involves smearing. The only downside is that I struggle to get them into pockets. They also also seem last forever, my last pair only had to be retried because I caught my heel on a sharp edge and that damaged the rand. Personally, I love them. They are the best when it comes to overhanging stuff. I'm fairly new to climbing (I've only climbed for a year) therefore the speedsters I bought are my second pair of climbing shoes only. I also have a pair of la spirtiva genius that has been great. - Easy to put on and off. Compared to Genius they have a worse fit. Of course this depends on the shape of your feet (mine are neither wide or narrow) but i would say that the biggest difference is in the lack of laces. I would say that the Speedsters are perfect for when you want to train indoors without having to tie, untie or strap your shoes all the time. Although they are not optimal for when you want to climb at your limits. Great for training, worse for projecting. I think you should buy them because they are a cheap option as an "extra pair". After having tried pretty much every shoe in Europe on my road trip, the Speedster is still my favourite. Especially the no edge system works perfect. Futura is too narrow for my feet and the Genius takes a lot of time to put on because of the sock and laces. The advantage of no edge is that there is virtually no wear until you're through the entire outer layer of rubber. Also you don't have to be so precise with how you turn your shoe on a small edge, since any part of the shoe will catch (with normal shoes you have to hit the edge of your shoe). Speedster is soft enough for good friction on volumes, if you don't buy them too small and stiff enough for really hard slab climbing on tiny holds. Through time there is a lot of stretch, but this just makes my competition shoes into training shoes over time. The toe pad allows for nice toe hooking and the heel is soft enough for good heel hooks. If I really want to stick something on volumes or in the roof, I use Drago though. The first pair of Speedsters I ever purchased were sent back to the shop (not Epic TV) because of poor stitching in the heel behind the 'pull on' tag. The replacement pair was a little better but I reinforced the stitching myself before using the shoes. I managed to get a full training season out of the shoe before they wore through on the toe. Note - I would advise applying a small bead of super glue along the rubber edges of the toes to prevent anything catching on them. If they catch the rubber tends to peel away, I do this with my Futura's too. These shoes are really good for indoor climbing and outside bouldering but too soft for outdoor sport climbing (for me anyway). My recent pair (3rd) of Speedsters have left me hugely disappointed. I have worn them 3 times for indoor route climbing and the elastic on top of one of the shoes has started to 'fall apart' where it is stitched to the central leather section. I reported this to EpicTv straight away, they passed on my email with photographs to La Sportiva whose response was 'this is wear and tear'. Seriously!! After 3 sessions! Really disappointed with La Sportiva for lack of customer care. I have worn La Sportiva shoes solely since 2011 and have always had excellent shoes but the build quality of the Speedster is poor. I did not expect a refund for the faulty shoes but did expect a replacement pair. It is worth noting that EpicTV did not offer to replace the shoes either so if you buy goods from them and they fail prematurely they will not replace faulty items, just pass your complaint on to the manufacturer. Poor.